Save Money, Order T-case Mount at the same time! Discount automatically applies in shopping cart. As you many have noticed while wheeling, your stock engine mount are made from soft rubber and steel blocks. These mounts worked great on the street but off roading they have a tendency to they will either flex far too much robbing you of performance, or even worse, the rubber will rip right in half! Obviously breaking an engine mount on the trail is a quick way to end a fun weekend. To eliminate this problem 4x Innovations engineered this beautiful creation. From the bottom up it was clear a small bushing just wouldn't do, so monster 2-inch Energy Suspension round bushings were selected to dampen engine vibrations. In order to squeeze this bushing between things like radiator hoses, your alternator, A/C pump, and more a whole new bracket had to be engineered. Over a year in the making the new brackets replace everything between your stock frame and engine block. As with all of our products the plates are laser cut and CNC formed and then jig welded for a precision fit every time. Kits are currently available as complete bolt-in sets for any 22R series motor. This covers the 22R, 22R-E, and 22R-ET. 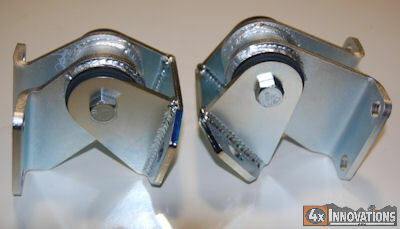 Coming soon will be weld on frame mounts to replace the stock mounting pad. Or you can purchase just the engine side brackets and build new frame side brackets of your own.